Leasing Available from $42.29 per month! Leasing Available from $46.06 per month! The Bridge Unit (BU3060) is a required accessory when the main unit is to be configured with either Finisher. The Bridge Unit transports pages from the printer's standard exit area into a Finisher for online stapling, punching, and/or folding. *Requires configuration with 550 x 2 Paper Feed Unit (PB3130) or 2,000-Sheet Large Capacity Tray (PB3140). The Large Cabinet Stand (FAC 56) must be selected when the printer main unit is to be configured with a Finisher, but not a paper supply option. The Caster Table Type D is recommended when the main unit is configured with the 550 x 1 Paper Feed Unit (PB3120). Normal Staple: 8.5" x 11" - 11" x 17"
The 4-Bin Mailbox Type CS3000 can be installed by itself or simultaneously with either Finisher; with or without paper supply options. The Hole Punch Unit Type PU3030 is optional for both Finishers; installs inside the Finisher. *Declared yield values in accordance with ISO/IEC 19798. The RICOH Aficio SP C830DN and SP C831DN are the easy choices for fast, productive, full-color printing. This versatile system offers incredible image quality and user-friendly customization to enhance efficiencies for light production environments. From the intuitive, full color touch-screen control panel with standard USB and SD Card slots to advanced security features, flexible media handling capabilities and eco-friendly enhancements, this system streamlines color workflows and improve productivity. Your customers will notice the compelling, attention-grabbing graphics. You'll appreciate the impact on your bottom line. Choose for your primary system and print everything for your office - or as an integral part of a Ricoh Managed Document Services (MDS) strategy and help improve printing productivity throughout your organization. Print with incredible speed and efficiency and get started quickly with short warm up times and first print speeds. Create an abundance of presentations, reports, brochures, booklets and more at up to 45 pages-per-minute. Deliver graphics-quality output on paper sizes up to 11" x 17" and keep more jobs in-house. With robust 4-bit color technology, the Ricoh Aficio SP C830DN and SP C831DN print with impressive 9600 x 600 dpi resolution for exceptional image clarity. The proprietary, oil-free polyester polymerization (PxP) toner delivers smooth gradations for crisper lines and sharper color reproductions. Edit images through the powerful drivers and take advantage of advanced color simulation. Perform tasks at your convenience with customized controls. The 4.3" color touch-screen control panel provides intuitive menu navigation and one-touch access to job and system status and frequently used job lists. Step-by-step, animated guidance and easy-to-see icons ensure easy operation. Users can even preview jobs before printing for optimal accuracy. Build a system configuration to accommodate the unique needs of your print environment. From 3.55" x 5.83" postcards and envelopes to saddle-stitched 11" x 17" booklets. The system comes standard with two 550-sheet paper trays and a 100-sheet Bypass Tray. Optional Paper Feed Units add an additional 1,100 sheets or an optional 1,200-sheet Side Large Capacity Tray and 2,000-sheet Large Capacity Tray extend maximum paper supply to 4,400 sheets for higher volume environments. User authentication requires users to swipe an ID card or submit a password at the control panel to access user-assigned tasks and documents. The 250 GB HDD (optional for the SP C830DN) protects latent images stored at the printer with Data Encryption and DataOverwriteSecurity System (DOSS). With the HDD, a Locked Print feature stores documents with sensitive information until they are released by authorized users at the device. Administrators can set print quotas to limit user volumes, set print rules and curb unnecessary printing. The system features multiple finishing options to stack, staple and hole-punch documents as well as create saddle-stitched booklets in-house. This printer may be configured with a user-assignable 4-Bin Mailbox and/ or one of two finishers capable of stapling, hole punching, and saddle stitch booklet production. The 3,000-sheet Finisher is ideal for high volume environments that require long, unattended print runs and the ability to staple in portrait or landscape orientation. Eco Night Sensor gives you a choice for how you want to conserve energy when the office is empty. Choose whether the printer turns off automatically, or enters Sleep mode, after the lights are off for a preset time period. Advanced fusing technology requires less electricity to warm up for faster first print and recovery times. The Eco-Friendly Indicator on the control panel displays each user's print history and its simulated impact on the environment to encourage more responsible printing. The Ricoh Aficio SP C830DN and SP C831DN feature a USB/SD card slot right onthe control panel, so users can print files from portable media with ease. Users can also print using their smartphones and tablets for easy, on-the-go performance. With one simple application download, users gain access to a host of mobile printing functions that streamline workflow even more. 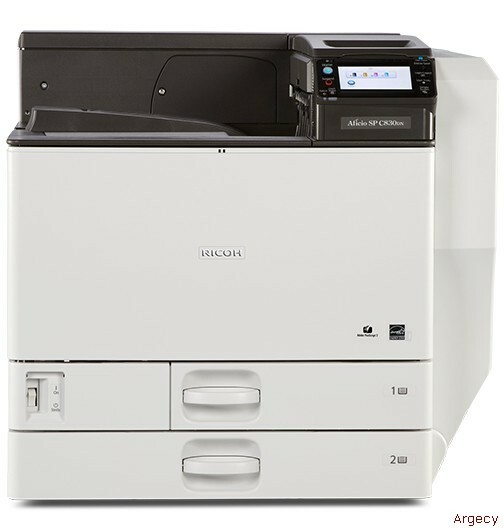 The Ricoh Aficio SP C830DN and SP C831DN are completely user-serviceable to maximize uptime. The Ricoh Aficio SP C830DN and SP C831DN offer seamless network connectivity with Standard USB 2.0 and 10/100 Base-TX Ethernet interfaces for peer-to-peer and shared use environments. Dual USB 2.0 host interfaces allow for direct connection to third party external devices, including a magnetic card reader for user authentication and to print from PictBridgeenabled cameras. The Aficio SP C830DN and SP C831DN also include optional Gigabit, Wireless LAN and parallel interfaces to meet your unique network requirements. and Optional 2,000-Sheet LCT: 14 - 68 lb. Optional 1,200-Sheet Side LCT: 16 - 58 lb.